Remember that claim "global warming is causing cherry trees to bloom earlier" ? – Never mind, light pollution is likely the cause | Watts Up With That? 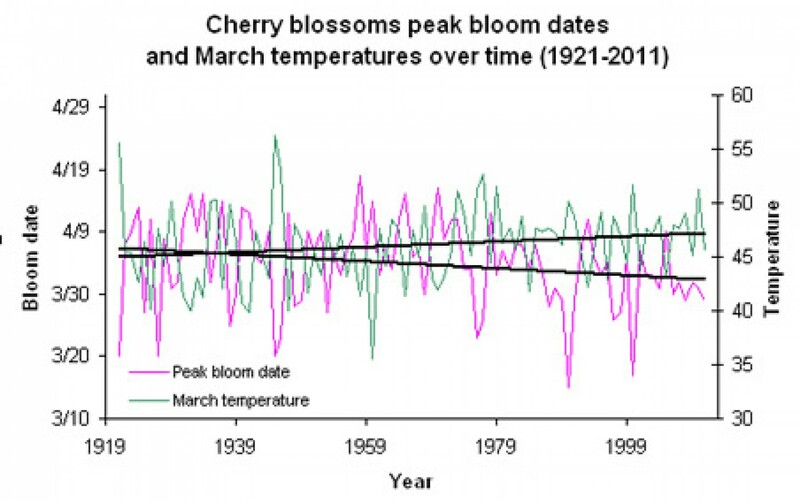 My analysis of temperatures and blooms dates reveals Washington’s average March temperature has warmed 2.3 degrees in the last 90 years and that the cherry blossom peak bloom date has shifted a little more than 5 days earlier (based on simple linear regression). That’s what happened to Jason Samenow – he fooled himself, and in the process of publishing that article, fooled others. But he didn’t look at other factors that affect trees and tree growth, he didn’t pay attention to Liebig’s Law of the Minimum. He’s in good company, neither did Dr. Michael Mann when he assumed that trees were only responding to temperature and nothing else. This study just published in Proceedings of the Royal Society B says temperature alone can’t be the cause, light pollution is a major factor too, since trees also respond to increased light, be it sunlight or light pollution from a growing and glowing city. This article in Engineering and Technology Magazine summ it up well (h/t to Peter Michael Ward on Twitter). Research by a team from the University of Exeter and independent environmental consultants Spalding Associates has combined air pollution data from satellite images with information from the public about budding trees. The comparison revealed that in areas with the highest levels of night-time light exposure, citizen scientists reported spotting emerging leaves on trees up to 7.5 days earlier. The team focused on larger trees such as oak, ash, beech and sycamore. However, they stressed the effects would most likely be seen across the fauna and flora of affected areas. “Our finding that the timing of bud burst of woodland tree species may be affected by light pollution suggests that smaller plants growing below the height of street lights are even more likely to be affected,” said Professor Richard Ffrench-Constant of the University of Exeter’s department of Biosciences. …the advance in budburst across all sites is too large to be explained by increases in temperature alone. As light pollution is a growing global phenomenon, the findings of this study are likely to be applicable to a wide range of species interactions across the world. The ecological impact of night-time lighting is of concern because of its well-demonstrated effects on animal behaviour. However, the potential of light pollution to change plant phenology and its corresponding knock-on effects on associated herbivores are less clear. Here, we test if artificial lighting can advance the timing of budburst in trees. We took a UK-wide 13 year dataset of spatially referenced budburst data from four deciduous tree species and matched it with both satellite imagery of night-time lighting and average spring temperature. We find that budburst occurs up to 7.5 days earlier in brighter areas, with the relationship being more pronounced for later-budding species. Excluding large urban areas from the analysis showed an even more pronounced advance of budburst, confirming that the urban ‘heat-island’ effect is not the sole cause of earlier urban budburst. Similarly, the advance in budburst across all sites is too large to be explained by increases in temperature alone. This dramatic advance of budburst illustrates the need for further experimental investigation into the impact of artificial night-time lighting on plant phenology and subsequent species interactions. As light pollution is a growing global phenomenon, the findings of this study are likely to be applicable to a wide range of species interactions across the world. (a) Average spring temperatures in 2011, (b) DMSP night-time lights in 2011, (c–f) locations of budburst data for all years, for (in order of budburst) sycamore (c), beech (d), oak (e) and ash (f). The results highlight, for the first time, to our knowledge, and at a national scale, a relationship between the amount of artificial night-time light and the date of budburst in deciduous trees. This relationship is unlikely to be caused by the UHI effect, as it is robust to the exclusion of large urban areas where temperatures are known to be elevated. Similarly, this effect is unlikely to be related to an increase in temperature alone; the maximum magnitude of effect size predicted between the brightest and darkest sites (7.5 days) is roughly equivalent to that predicted due to 2°C. Specifically, it has already been shown that urban areas are both brighter (DMSP data have been used as a proxy measure of urban extent [29,30]) and warmer (UHI effect ) but this is, to our knowledge, the first study explicitly investigating the relationship between the amount of night-time light and budburst while controlling for the temperature increases within urban areas. In summary, similar predictions were obtained from a model fitted to budburst data points found outside of large urban areas suggesting that it is night-time lighting causing the advance in budburst as opposed to other factors which can vary owing to urbanization, such as temperature, humidity, water availability and chemical pollution levels [38–41]. In addition, for trees experiencing average spring temperatures of 4°C, the model predicts that budburst will be advanced by up to 7.5 days in the brightest areas compared to the darkest areas. The exposure of plants to artificial light at night is highly heterogeneous at a fine scale. Skyglow, diffuse light scattered in the atmosphere from city lights, can illuminate areas of many square kilometres to levels exceeding moonlight, but effects of artificial light on phenology have to date only been recorded as a consequence of direct illumination in the vicinity of light sources, which can be several orders of magnitude brighter . As the spatial data for this study was aggregated to 5 km resolution, and the DMSP data have no direct calibration, the DMSP value for each pixel cannot be easily related to an illuminance or irradiance that any individual tree is exposed to at night. Moreover, even in dark pixels, an individual tree adjacent to a street light may be exposed to bright light, while a tree in a large unlit urban park might be relatively dark despite being located in a bright pixel. However, the DMSP pixel brightness is probably a good indication of the density of outdoor light sources, and hence the probability of any tree within that pixel experiencing a relatively high level of direct illumination; observers recording the first budbreak in three trees in close proximity will therefore be considerably more likely to be recording trees exposed to artificial light in ‘bright’ than ‘dark’ pixels. Our finding that phenology of woodland tree species may be affected by light pollution, suggests that smaller plants growing below the height of street lights are even more likely to be affected. Such results highlight the need to carry out experimental investigation into the impact of artificial night-time lighting on phenology and species interactions. It also suggests that looking at other aspects of phenology, such as leaf senescence, would be highly worthwhile. Importantly, further studies should also try and take into account differences in light quality such as the specific wavelengths of light generated by different lighting types. June 29, 2016 in Climate News. I thought about UHI, but I didn’t consider “light pollution” as a cause. Light pollution as a cause would be really easy to demonstrate as those trees directly below the lights would bloom either first and hours to days sooner or possible more abundantly than those trees farther away from the light source. Color me surprised. Light pollution is a problem well known of indoor growers. Ask Jack Herrer. Greenhouses often have different spectra of lights installed so that they can control flowering. Duration, intensity, and color of light all matter. The exact mix is plant variety specific, but knowing what your crop needs is why you can get fresh tomatoes and orchids in January in Chicago. Yes. That is what NPS reports, because it is what tourists want to see. The second study, that talks about “budbursts” was done in Britain. I sincerely doubt light affects flower buds to any degree, especially city lights as opposed to brighter wavelength specific growing lights. Temperature would be the determining factor here. Perhaps warmer nights due to heat absorbing pavement and building re-radiating rather than AGW. Sorry, I was asleep. It happens. I grew up and still live in the DC area. The cherry blossoms are always a crapshoot, and there are handwringing articles every year about whether the bloom/peak will coincide with the festival (hint, much of the time it is before or after), whether recent frosts mean the bloom will be unimpressive, will the oldest trees continue to survive…and now, if AGW will ruin everything. Reality: just about every square inch of the DC area has been developed (and often redeveloped) over the last 90+ years. The DC of 2016 is not the same as the DC of 2006 or 1996 or 1986. Tons more pavement everywhere. Heck of a lot more people. 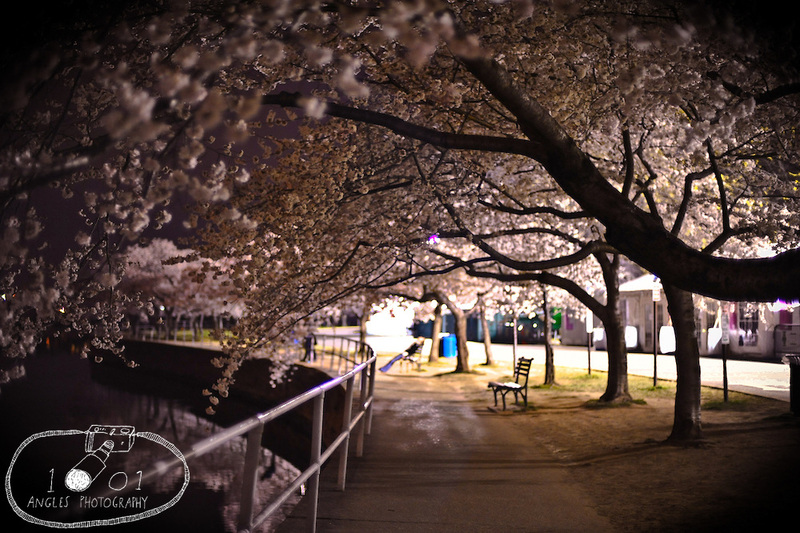 Lots and lots of lighting installed around the Tidal Basin and other areas with lots of trees, cherry and others. Huge number of tourists, worse traffic (with way more emissions around the trees as everyone circles looking for non-existent parking), and the occasional beaver probably have a bigger effect than a little supposed warming. Heck, the increased CO2 from the cars might be giving the trees a jump. Any temp change or bloom date change is more likely due to the overdevelopment of the area than to supposed AGW. Has he controlled for other factors such as these? **The 2011 March average was 0.9 degrees below the historical average (always a tricky number), and peak hit March 29. The 2016 March average was 6.5 degrees above the HA, and peak hit March 25. A 7.4 degree difference, and the dates differ by 4 days. **The 2012 March average was 10 degrees higher than the HA, and the peak date was March 20. That is 10.9 degrees higher than 2011, but peak dates only differ by 9 days. There is a 3.5 degree difference between 2012 and 2016, yet peak differs by 5 days. **In contrast, the 2015 March average was 1.5 degrees lower than the historical average, and peak hit April 10. That is a 0.6 degree difference between 2011 and 2015, yet the peak bloom dates differ by 16 days. The above is cherry picking (no pun intended), only using data from 2011-2016 (from http://www.cherryblossomwatch.com), and 2012-2016 are not represented in the above graph. We all know 5 years does not make a climate. The above differences still imply that any relationship between March temperature averages and peak bloom date is likely more complicated than the reporter claims. The weather here has been insane and unpredictable since the 1980s and probably before (I did not exist then). People who say otherwise have short memories. If all the climbing kids and adults, all the tourists breaking off twigs, and all the soil compaction has not destroyed the cherry blossom trees, I am confident that slightly milder winters and springs will not threaten their survival. It’s almost like you can see the affect of the LIA in the Kyoto data. Nah, that would make the LIA global when we all know it only occurred in Europe. Nah, that would make the LIA global when we have all been instructed by the High Priests that it only occurred in Europe [on Tuesdays and Thursdays]. Auto, unable to resist the opportunity to be just a bit snarky. Minor point, I know, but it’s actually even-numbered Tuesdays and Thursdays. I won’t sit idle for misinterpretations of the High Priests’ entrails readings. I don’t wish to tempt the wrath of the CO2 gods and cause the oceans to boil away. Not worth the risk. H.R, fully appreciative of the nice slow-pitched softball Auto just tossed. I thought links without commentary violates Anthony’s rules, but our sun guy gets a pass. However, a little commentary on the implications of Isvalgaard’s link. Seems that lsvalgaard’s implication would be that the paper by Aono is somehow a refutation or a counter point to the post. First, the article attributes the early blossoming date to UHI and secondly to AGW. But secondly the reason for the paper is to use cherry blossoming as a proxy for temperature. Hence, lsvalgaard link addresses really nothing to the posting that being blossoming dates are more complex than the climate scientist choose to associate. And the paper has no temp record to support the blossoming. They have blossoming to support a proxy. A better paper that comes closer is by Matzneller et al. that (sigh) builds several models to predict the future. They discovered that the (sigh) ‘chill-forcings’ were insufficient for ‘validating’ the models and the inclusion of Daylight Length was necessary to get a good outcome. They almost reached the point of defining a light amount parameter (that could then include light pollution ‘forcings’) and perhaps discovered that temps and light are two parameters that would properly be needed to predict blossoming well and that the light (I would bet) would be the greatest ‘forcing’ and temp only needs a threshold value. Maple syrup farmers can tell you about the temp threshold concept. But Midwest corn growers rock the themp threshold concept and heat units. Historically, the number of days from planting to harvest has been used to classify the maturity of corn hybrid; but in recent years, commercial corn hybrid maturity is often determined by growing – degree days (GDD) or heat units (Hu). Growing-degree days are systems used to classify the maturity of corn hybrids. GDD result from summation of mean daily temperature. Here you can see a threshold and a heat unit measures to predict growing. They also have these for grain-fill stage. “sun guy” ?, nobody even mentioned cloud cover. Thanks for the graph, Dr. Svalgaard. The forecast dates for the various cherry blossom festivals in Japan are usually based on the temperature, rain and wind. The question is: would considering light pollution in the mix improve the accuracy of those forecasts? Actually it is not just the amount of light, but the frequency and timing of that light that prompts plant response. While visiting a huge greenhouse for growing pointsettas, I asked how it was they kept them so compact and bushy. I learned that they control the amount of light at precise one hour segments of both dawn and dusk in order to control the height of the plant. Without that control the nicely proportioned leafy bush becomes a tall spindly plant. 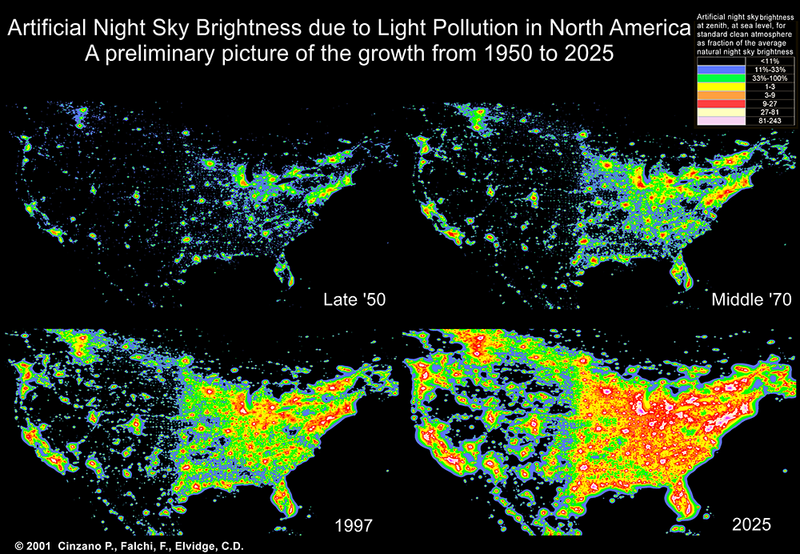 Would light pollution change that much from one year to the next? If not, then it would make no difference to the forecasts. Good grief, can we find a name other than “light pollution”. When the lights go out it’s “dark pollution” that concerns me. If I’m given a choice of air conditioning or seeing the milky way, I’m choosing air conditioning; every time. There are things in orbit that will send me really good pictures if I’m interested. Hi les, Ornamental greenhouses also use Chlormequat chloride to inhibit plant hormone giberrelin to keep plants shorter. Some plants get this at 1-3 week intervals once elongation steps up, or 2-4 weeks after a transplanted cutting’s growth starts. The mode of application varies (foliar vs. drench) & this requires dosage used being appropriate, bug the grower must stop using its once floral bracts develop (inflorescence) or the compound not only delays flowering, but also reduces the size of floral bracts. Your are correct in pointing out manipulation of light is used to control greenhouse plant growth. By altering the ratios of different wavelengths the plant responses are altered. Ornamentals grown for “green” visual allure will get boosted blue light because this holds down side budding & also creates larger chloroplasts to make chlorophyll (than red spectrum which fosters smaller chloroplasts & more carbon from CO2 stored as starch in amyloplasts). To get flower buds to come along growers increase the amount of red light than had been using when holding their plants back from flowering until sending out to customers. You noted timing & blue light influences plant circadian clock rhythm. I keeps hormone auxin’s players (PIN/GFT) at cell membranes (plasma membrane) instead of being degraded (in vacuole). This also keeps auxin moving in roots so grower get good rooting to allow ornamental leaves (“source” ) keep healthy by unloading assimilates in the active roots (“sink”). Red light influences hormone auxin responders (PIN/GFT) to naturally go into vacuoles (where degraded) in cyclical response; which stops auxin moving. Red fosters side (axillary) shoot growth because it’s reinforces the plant hormone cytokinin. main stem & reduced branching. Air conditioning doesn’t cause light pollution, so you wouldn’t have to give it up. Its the unnecessary street lights that bug me. I don’t like giving burglars enough light that they don’t need a flashlight that would give away their presence. My poor attempt at html failed. Gringojay, thanks for that far more technical explanation. Would street light frequencies selectively enhance the flowering process for these cherry trees? Hi les, – Floral gene induction use a band of cells underlying shoot stem cells (shoot apical meri-stem). The plant hormone (phytohormone) gibberellin interacts with genes (KNOX) that maintain shoot apical meristem. Increased activity of gibberellin (there are over 100 gibberellins) causes more hydrolytic enzyme activity; which breaks dormancy. Hydrolytic enzymes lead to phytohormones used for floral transition. There is a gene group for flower budding that is not significantly active in vegetative shoot tips: it is in pre-floral & floral shoot tips. Cytokinin itself causes an increase of this member of floral bud genes in the floral bracht; & cytokinin level locally rises at floral initiation. The % of cytokinin (or it’s altered signalling) leads to changes in the level of messenger RNA belonging to the teanscriptors (KNAT1) regulating the genes (KNOX) integral to stem cells (shoot apical meristem) flowers come from. This explains some of the cross-talk among gibberellin & cytokinin. Cytokinin (there are different kinds) itself induces more extensin (by acting on zones of dividing cells) extensin upregulation increases flower formation when hydrolytic enzymes alter the adenine residues of cytokinin (formed from adenine). It is also cyotokinin signalling that sustains vascular activity (pro-cambium cells) in the stem of an inflorescence. the blue light exposed tissue cytokinin relatively freed from normal auxin counter-control. It bears mentioning that cytokinin hormone responds to temperature & the plant geno-type might “like” cool or like warmth. So I would say a warming or cooling temperature could have some relation to different blooming varieties. By the way: ornamental greenhouse growers also commonly spray Dikegulac to create bushy plants (halts apical dominance from auxin);or Ancymidol (another gibberelkin antagonist)or dark green leaves that are thick on a compact plant with less distance between internodes. So, anybody who bought a beautiful plant at a nursery & it never quite did well for long at home, despite good care, probably can blame it’s earlier hormonal distortions creating epi-genetic conflict over time. We CAN assume anything. But SHOULD we? Such an assumption implies that the National Park Service at the Mall have learned nothing significant about the care and health of cherry trees over the past 100+ years and the products they use on the trees haven’t change in a century. Preposterous. Be it from better care, UHI warming, night lights, or global climate change, cheery trees in Wash DC are reacting to spring a few days earlier than before. Why is this a bad thing? Are the number of days of bloom any shorter? Are the number of petals fewer? Are blooms more subject to late freezes? Even if the answer to any of these is “Yes”, what realistically can be done to change it? Remove the UHI effect by shutting down Washington, DC? ….. Now there’s an idea worth more consideration! If they start to bud too early, they could be vulnerable to a late season frost. Of course. But have they? If it is UHI, they might be less vulnerable. I guess the real way to test this theory is to examine plant and tree flowering in North Korea. Not much light pollution there. So which is better for plants? No light pollution due to economic starvation from dictatorial communism or more atmospheric CO2 due to economic opportunity from capitalism? Who is going to volunteer to go there? North Korea is the obvious choice to test and verify this theory. But which is better for plants? No light pollution due to economic starvation from dictatorial communism? Or more atmospheric CO2 due to economic opportunity from capitalism? I apologize to everyone for the double post. Once again, a story is fabricated on average temperatures rather than more appropriate high or low temperatures, which are trending differently, particularly over land. Low temperatures control the last killing frost and high temperatures control rate of growth and water stress. The graph in that article only goes up to 2011. In 2013, 2014 and 2015, the peak bloom days were 99, 100, and 100, all above the mean of 93. This year it was 85. Graphing the data through 2016 still gives a negative slope for the linear regression line (-0.05), up from -0.06 for the graph through 2012. I’m a little confused (no surprise there). I don’t have my data available, but about 6 months ago, I looked up the peak bloom datas for the cherry trees in DC, and I averaged the peak bloom date for the first ten years (1921 to 1930), and the last ten I had (2005 to 2014). I assigned a number to each date from earliest to latest in the record, and then used them to obtain an average for the years in question. To my surprise, the average came out the same. Maybe I misfigured something? Ok fellers and smart fellows, I will take photos next year when citrus bloom on my street. I have a master gardener down the street, about 2 miles, that have the same Myers lemons as I do. His land has a subdivision lake within a 1/4 mile. about a mile farther north is a large bayou. His blooms always happen about 2 weeks before mine. His home rarely have exterior lights on. This has caught him twice in the last 6 years with blooms starting when a light frost hits. I can then conclude, with confidence, that it’s the combination of humidity and warmth that causes his earlier blooms. We actually sat down with Dr. J, of Galveston county master gardeners, and discussed this with him. similar conclusion. You will find that it will most likely be the temperature of the soil at a given depth that will cause the time of the blooms. Seeds in a garden best propagate at a determined soil temperature at a given depth, approx. 6″. NO streetlights/light at all at night apart from the moon when out. And as most of you know it is not light but the type of light that will accentuate growth. I’m an arborist by profession – a tree doctor of 18 years experience – and I was an orchardist of 15 years before that. I raised sweet cherry trees and one very important factor in all stone-fruits is the amount of cold they get in the winter. It’s not heat that causes them to wake up earlier but cold. The reason is that cherry trees require about 1,200 cold hours during winter dormancy to set the buds that will produce the flowers that produce the fruit. In fruit tree jargon, this is known as the cold-hardiness of the tree. Now a cold-hour is defined as one hour at 7-degrees Celsius during winter dormancy. Cherry trees accumulate one cold-hour at that temperature. If the temperature goes up cold hour accumulation slows down, if the ambient temperature gets to 10-C then the cold-hour accumulation stops. If the temperature goes above 15-C then cold hours are subtracted because the tree starts to wake up. Also, the more the temperature drops below 7-C the slower the accumulation of cold-hours because the tree’s metabolism slows down. At zero-C and below cold-hour accumulation stops because it’s too cold for the tree to function at all. Now cherry trees don’t wake up until they have gotten their cold-hours. So contrary to popular belief, if the cherry trees in Washington are waking up earlier it’s not because the climate is turning warmer, quite the opposite, it’s because the trees are getting their compliment of cold hours earlier. Now unless ambient temperatures are below 0-C then they don’t break dormancy until temps rise to over 5-degrees C, but if the trees have gotten their dormancy hours and any ambient temperature above 5-C means they will break dormancy. So warm weather has little to do with the trees breaking dormancy, it has much more to do with the trees having gotten their cold-hours, so they’ve gotten their winter sleep so they will wake up. Should it happen that it’s a very warm winter and temps are mostly above 10-C then the trees will NOT break dormancy. They will wait and wait and wait, in effect, the trees hope to get their cold hours and will delay waking up. Should that happen – and one or two years we had such conditions -, the trees will slowly, reluctantly, break dormancy a month or 6 weeks late, with very slow and uneven growth and almost no flowers. Cold-hours are absolutely essential for the formation of the flowers within the buds, and without the required amount of winter cold-hours cherry trees produce nearly no flowers. The few flowers that develop are nearly sterile and there’s no crop from that year. Yes, it’s contrary to human logic and contrary to the prevailing fad-thinking that AGW is the reason for all that is bad in this world but cold-hardiness of cherry trees is the primary factor of when they break dormancy, not the warmth of the ambient air. Hi D.B., Cold period (vernalization) gives ability to flower, as you explained, when conditions are right; the plant holds it’s “memory” & will lose that imprint to get a new “memory” in the next cold season. The vernalization exposure modifies DNA packaging (chromatin) & enzymes modify structure (histone) in a way that creates an epi-genetic modification of transcription factor (genetic expression actor) so that cells can not flower, but later on “daughter” stem cells (meri-stem) cells can flower. Prolonged low temperature has an add on effect to cold period vernalization, so there can be 2 transcriptors (proteins) which act on the chromatin (DNA packaging) related to flowering. Both epi-genetic actors create the “memory” of winter cold; however later one imprint favors the transcription factor which keeps genes that initiate flowering shut off (silenced)& the other imprint comes into force in a way that the cold induced epi-genetic pattern loses sway (silences gene of transcription factor holding down flowering) & genes that initiate flowering can be operating. Gibberellin plant hormone being low leads to later flowering; it acts on some other genes that create flowering. For gibberellin to act in this vector it needs to be in conjunction with sucrose (sugar); & for gibberellin/sucrose to elicit activity in genes that create flowering other genes have to 1st stop holding down a flowering gene. these things. Posting unedited, so pardon any messed up content. What the artificial light theory implies is that photoperiod (adequate time in darkness) is a component in cherry flowering phenology in combination with adequate vernalization. A cursory search indicates that photoperiod is at best not a major component but others might know more. Hi ColinD,- Due to an effect known as Rayleigh scattering blue spectrum light creates greater sky glow nearby than say yellow light (low pressure sodium steeet lights are yellow). The most widely used street lights are high pressure sodium, which look more amber but do have some blue spectrum (from mercury). As for metal halides that look white these also have blue, mercury vapor looks whitish blue from it’s blue & “white” LED also has blue spectrum (with cool white LED & warm white LED having different amounts of blue). (otherwise auxin hormone keeps holding floral budding down). At gibberellin induction of bud formation cytokinin hormone (can bind to cell nucleus, creating an “estrogen-like” signal) becomes a relevant actor (as more cytokinin comes in using second messengers from G-protein signalling); these 2 plant hormones create a non-linear hormone synergy which then leads to flowering (& am glossing over other phytohormones for easier reading). Having so far skipped photoperiod (& temperature) I’d like to suggest that since many street lights now are coming on at dusk, before a total dark interval, this complicates photoperiod responses. The illuminated plants are living in a light environment that unaturally alters the duration of exposure, the wavelenghts at dusk & the light flux density. would the increase in CO2 (regardless of other variables) have any effect on bloom date? There is no need for plant food during dormancy. you generally give plant food only during growing season, Texas, Galveston county, starting in march and every three months through and into September/October. CO2 is used for photosynthesis during the growing season, Plant decay during winter creates extra CO2. Also plants will emit CO at night and or when no sun is available. Here is a good site for all your growing needs. Ask the grounds keepers at Augusta National how they make all their blooms come out exactly on the week of the Masters, even though it is on a different week some years. I live in an urban area where for the last 3 years 95% of street lighting has been turned off after midnight for “energy conservation”. It really goes black! It is quite easy to observe that trees and plants growing near the few remaining street lights left on all night, have earlier bud burst and later leaf fall. Of particular interest is the behaviour of daffodils under the “always on” street lights which do flower many weeks before their peers who are kept in the dark. So we should string up some grow-lights on the garden then. It’ll probably work. But I think it would have to be the intensity of the light etc that could make a difference. 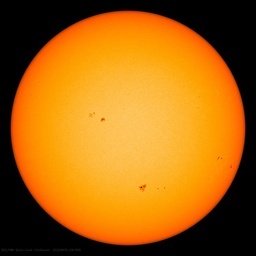 During the day-time, up to 960 W/m2 is coming in from the Sun as energy for the plants. Your night-time street lights are nowhere near that intensity and shouldn’t make any difference at all but different light types could. High energy change will bring down ATF. for wacky tobacky conspiracy. Anthony, you have it all wrong. Again. Just look again. Very little climate change in 1950 and very little light pollution. Mid-70’s and it’s starting to warm up and the picture shows increased light pollution. 1997 even warmer and much more light pollution. And the projection of light pollution in 2025 would mean catastrophic warming. Climate change causes light pollution. 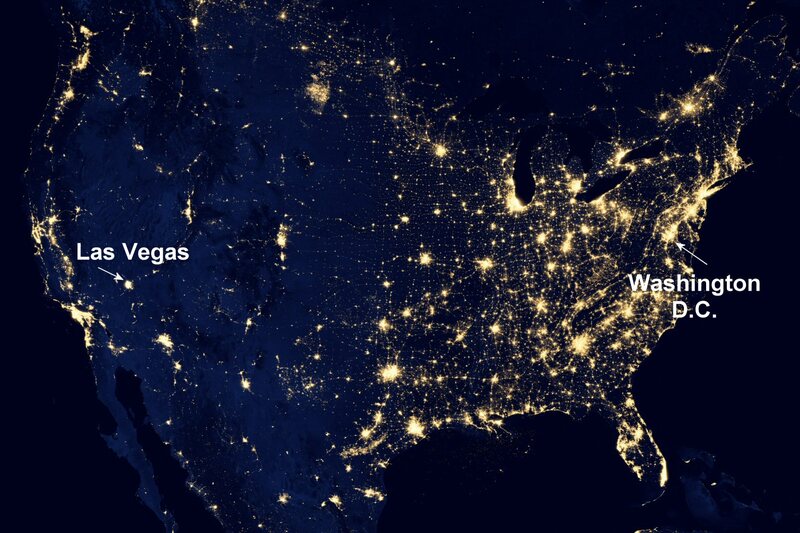 Your picture of light pollution in the US since 1950 proves it. I have no solution for the frosts, but for the deer I’ve planted a couple of extra trees. We share. In case anyone cares, this is a good year for Cherries and Strawberries. Plum Tree blossoms, except the yellow Shiro, froze. I’ll care if you will share! A lot of old street lights are being replaced with brighter LED lights. So this is going to contribute even more. I clicked in here to see if anyone commented on this. Most streetlights over the last few decades have been sodium vapor or mercury vapor, which are orange-ish or green-ish. The new LED lights are a fuller spectrum white, so I expect they will be even more effective at lighting plants. The actual LED makes only a bright blue that gets down shifted to other colors via phosphors. Shifting less is more efficient, so excess blue is left to get better efficiency numbers. There are some LED bulbs using three different color LEDS, but that costs more so usually doesn’t make through the purchasing department spreadsheet / bidding. This caused the spouse insomnia, so I now have $100 of LED bulbs in a drawer… CFL, incandescents, HID, HPS and low pressure sodium, and halogen bulbs don’t cause her insomnia. Just the LEDs. I hope someday they fix this. There doesn’t appear to be a comment about the fact that photoperiod control flowering in many plant species and yes artificial light affects this. 5 days doesn’t seem like a very big deal to me. It is a big deal — and an advantage/benefit. I was just in Japan this year for sakura season. They have incredibly detailed info available. And you’ll see that sakura blooms a couple of weeks earlier in Tokyo than the rest of the island. Just Tokyo. Not the whole latitude, or just the east coast. Just Tokyo. The Sakura front wrap around just like an inverted Mt Fuji drilled a couple of km into the earth’s crust. There’s nothing “global” about it. It’s UHI – and yes, perhaps some lighting issues too. Interesting article, but was it really necessary to dig up old misdeeds of Japan? I fully agree with Andrew above that there must of course be a significant component of UHI as the city has grown and warmed over time. So why is that not the cause of the temperature component of the graph? Also, it is clear that these trees have grown and matured, developed larger root systems and greater nutrient stores over time. Can that not have an impact on their ability to bloom earlier. Unless we were talking about the same species/age/size of trees over the multi decade period I am not happy to rule out growth changes as a feature of this observation. And finally, who is being harmed by the cherry blossoms? How has this disrupted Gaia’s sleep? And please tell me this is not research being funded by tax payers. Only a handful of the semi-original trees remain (the first batch went kaput). A good many of the trees are relatively large, with some young ones here and there that NPS have planted. There are also at least 3 different species, peak is supposed to be based on a particular species being ~70% open. Not at all subjective. 😉 I do not know if the same standard has been used to determine peak for the last 100+ years. The only people who might lose sleep over this are tourists (trying to time their visits just right) and the people running the Cherry Blossom Festival. Looked back over the comment and realized the reference was to Tokyo, not D.C. My bad! Did you read this part of the paper’s abstract? “UK-wide,” “Excluding large urban areas,” ‘heat-island’…. 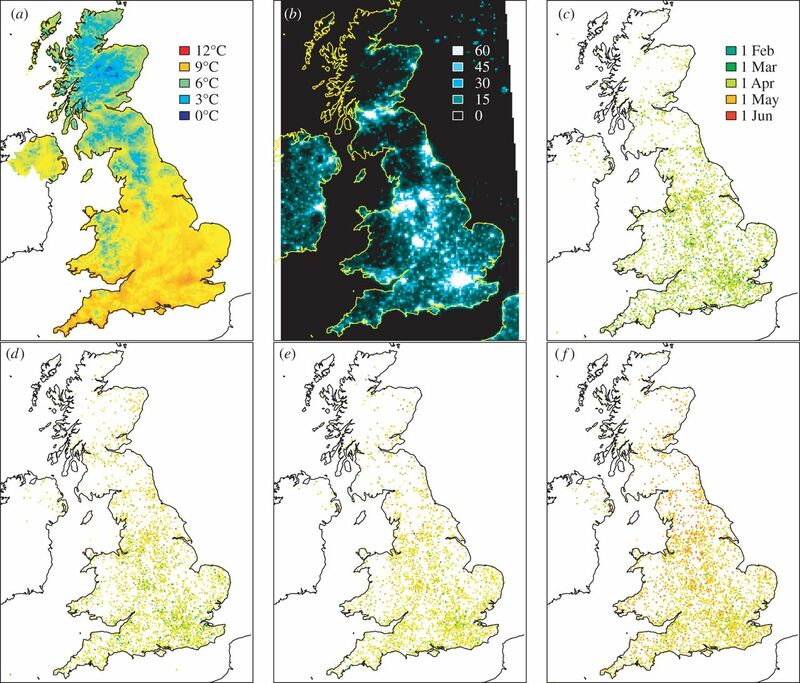 We took a UK-wide 13 year dataset of spatially referenced budburst data from four deciduous tree species and matched it with both satellite imagery of night-time lighting and average spring temperature. We find that budburst occurs up to 7.5 days earlier in brighter areas, with the relationship being more pronounced for later-budding species. Excluding large urban areas from the analysis showed an even more pronounced advance of budburst, confirming that the urban ‘heat-island’ effect is not the sole cause of earlier urban budburst. The other likely issue re: available light is the significant decrease in airborne pollutants since the 1970’s and the resultant increase in sunlight reaching the surface. Uncritical thinking or decision making based on emotion is learned, in (significant) part, through the example that is set by the educators. The teachers talk ‘critical thinking’ all day long, but if they don’t set the example then it is big waste of time. Almost anything that seems slightly out of the ordinary in the natural world now seems to have global warming or climate change immediately slapped on it as the cause. They wouldn’t know what’s out of the ordinary, because they don’t even know what ordinary is! Every year here in the Skagit Valley in Western Washington, there is much wailing and gnashing of teeth if the tulips bloom a few days early. But if they’re a week late due to cool temps, it’s just a slight variation. The hypocrisy is so thick you couldn’t cut it with a chainsaw. Looking at Jason’s graph, if one might conclude than increasing temperature is causing earlier blossoming, another might conclude that earlier blossoming is causing the temperature to increase. It is actually quite simple to test the hypothesis that factors OTHER THAN average March temperatures are significant. At the “eyeball level, the simple fact that there is an obvious correlation between temperatures and blossom dates for individual years would suggest that temperature is a key factor. For something more mathematical, do a linear regression using only March temperature to predict the blossom dates. Then look at the residuals (difference between actual data and the regression predictions). If light pollution is a significant factor in pushing the blossoms earlier, then the predictions from just the March temperatures should be too early a century ago and too late now (since a correction for light pollution would be partly responsible for the earlier blooms now). Or put another way, the slope of the residuals should be negative due to the contribution of the increasing light pollution. In truth, the slope comes out to -0.01 days earlier per year that are not accounted for by March temperatures, or about 1 day earlier over the course of the past century that could be attributed to light pollution (or any number of other factors, like CO2 fertilization, rainfall, clouds, better care by the National Park Service, February temperatures, etc, etc), and four days earlier due to temperatures. So temperature is about 4x more important than any of the other factors.